“Most participating countries will look to the United States for potential options. They may be disappointed. Elements within the Trump administration still seem to believe that Arab forces could potentially be deployed to replace its own but it was unrealistic months ago, before the announced withdrawal of the United States, and it’s even less realistic now that the United States has made it clear that they are not planning to stay in Syria”. 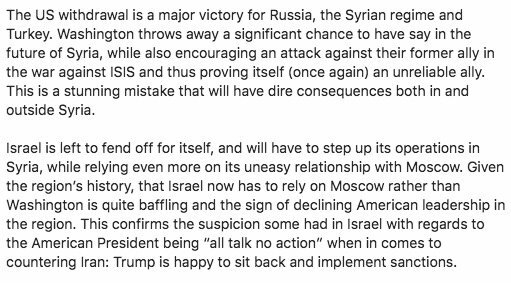 “Cooperation between Israel and the US after the withdrawal [from Syria] will certainly continue, but its value (in the eyes of the Israelis) will diminish. Without the presence of US forces (on the ground and in the air), the potential intelligence that Washington can provide will be of much lesser quality”, stated Deputy Head of Intel Michael Horowitz. “Israel is sending a message to Russia and Iran that the US withdrawal doesn’t mean that Israel can’t act in Syria, and that it shouldn’t be ignored,” Michael Horowitz, deputy director of intelligence for Lebeck International, a Gulf-based consultancy, told The Independent. Washington throws away a significant chance to have a say in the future of Syria”, explained Deputy Head of Intel Michael Horowitz, “while also encouraging an attack against their former ally in the war against ISIS and thus proving itself (once again) an unreliable ally”.